Tyler Trent Courage and Resilience Award now accepting applications. 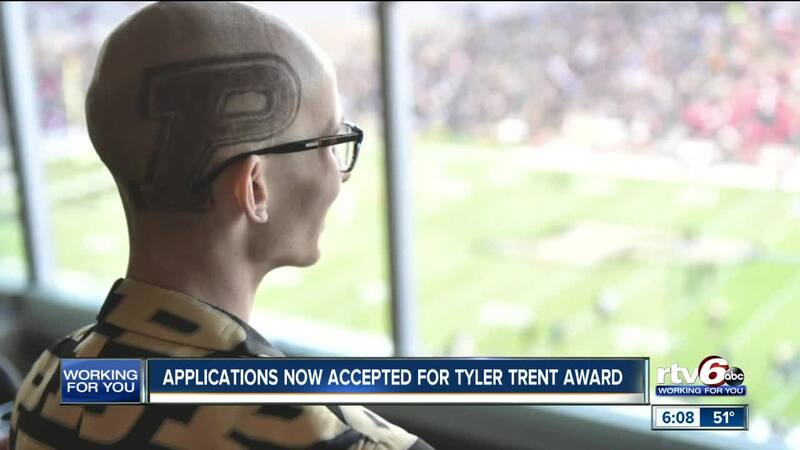 WEST LAFAYETTE — Purdue University announced that applications are open for The Tyler Trent Courage and Resilience Award on Friday, February 1. The scholarship is in honor of the former Purdue student who battled with cancer and inspired the nation, Tyler Trent. The scholarship will be awarded to an undergraduate student who is anywhere from a first-year through senior at the Purdue West Lafayette campus. Students who have encountered a serious physical adversity in their pursuit of higher education can nominate themselves, or be nominated by others. To apply, click here. The scholarship is funded through a combination of gifts according to Purdue university. At Purdue, Trent joined the Dance Marathon club, a student organization that raises funds and awareness for Riley Hospital for Children in Indianapolis, where he received treatment. He also worked as a sports writer for the Exponent, Purdue’s student newspaper. Trent was diagnosed with bone cancer at the age of 15. He was an enthusiastic supporter of the Purdue football team and captured national attention. Trent passed away on January 1 at his home in Carmel. Click here for more information about the Tyler Trent Courage and Resilience Award.